First Lieutenant Hussein al-Khalifa was serving in the Revolution Roads Center that belongs to Raqqa police station. Khalifa said that they received an order to leave their location and support another location due to being attacked by gunmen. The Lieutenant rushed to the support with two conscripts and a Colonel. As they arrived to an area, they saw a car that contains insurgents and the Colonel went and greeted them. 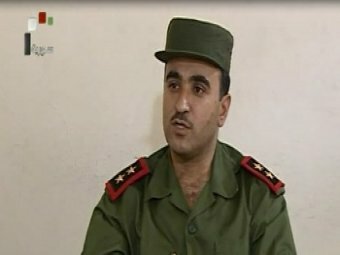 The Lieutenant though of the car for containing other soldiers who came to support the Syrian Army against the armed attack. The Lieutenant and his two soldiers went with the militants to Zakia village and to Manbej, where the defected First Lieutenant Abed al-Wahhab al-Khalaf, who is known for his violence, met with them. Al-Khalifa said that the gunmen drove them to Turkey illegally to Jrablos area. The Lieutenant said that the insurgents have Takfiri thoughts, as they depend on the Fatwas of the Golf countries and they do not belong to Islam under any circumstances. Al-Khalifa stated that the militants goal to extinguish the Syrian Country, not only the Syrian Regime, but including its people and Army.